Guest host Keith Bryan fills in for Kyle, and talks with Jason and guest David McGee from C2 Financial about the power of video. Giving personal first hand experience how he has seen video grow his business and engagement with his farm and client base. – It’s W-H-I-S-S-E-L just in case you didn’t know. – Right. Not like “Whistle While You Work”. – Not like that at all. – Even though we used to have it as a kickoff song and we kind of do on some of our stuff, but it’s W-H-I-S-S-E-L.
– Yeah, you’re just one of the norm. – And that’s what Kyle’s done such a great job with all his videos you mentioned, Brian. – Keith Brian, I apologize, Brian. – Keith Brian, so I’m calling you by both names there, Keith. You got two first names to me, or two last names, right? – So, you know, literally, people recognize him around town. – So, we’ve been to places where kids are like, “That’s Kyle Whissel.” I go, “You want to meet him?” Like, “I can meet Kyle Whissel?” Dave, you laugh, but this has literally happened. This is crazy, and you’re exactly right cause video just really stands out, and not everybody’s utilizing it, and what’s really cool about the Whissel Way at Whissel Realty is I’m just going to call Tom and Brian as I know, man: video nerds. These guys, and Tom’s shaking his head over here, right, he’s doing our show right now. He knows, you provide the content, Keith. – And they know how to put it together, make it look good, put words on there, make everything go, because this is what they’re trained to do. This is what they love to do, and you love serving clients in the real estate side, so it’s a perfect marriage that Kyle’s put together, and you just got to provide the content, get up there, show your face, they’ll make it all work. They get it on all the SEO, get it on all the things that need to happen in social media, and that’s what’s the perfect marriage. The Whissel Way. – [Keith] Absolutely. You got me thinking about one of the services, the benefits that Kyle Whissel provides to the team agents at Whissel Realty is a once-a-month green screen opportunity. Now, you’re talking about content. So every month, all of us team agents come up with content, and we send it over to Brian or to Tom, to Thomas, to take a look at, and we schedule a half-hour slot to get in front of a green screen and do a presentation, and this month, I’m really excited about, I had a green screen opportunity just before Christmas, and my subject matter was, what are the benefits of meeting with a great lender like the two of you guys prior to going out and buying a home? You know, the benefits are one, finding out what you’re budgeted for. Two, getting your pre-approval letters for when you’re ready to write your offer. And I had this idea while I was presenting my subject matter I said, let’s do something fun, creative, and out of the box, and that’s kind of what I like about Whissel Realty, is they give us room for thinking outside the box and injecting our own creativity, so I said to Brian, Let’s do this split skit. I’m going to present as the agent, and then I’m also going to be the buyer, so we’ll bring in the buyer and it will be me, and then I’m also going to be the lender. – You had three hats. – I had three hats. The same person. Different attire, in the video. It was really humorous and comical. It came out really well. One of the, you saw it, Dave? – I saw it. It looked really good. Very Professional. – I appreciate that, thank you. And that’s done with the help of Thomas and Brian Over at Whissel Realty, so that creativity in the use of the video… You know, we live in a day and age where everything’s social media. And what better way to market yourself than in video content? It costs you nothing. You have your cellphone. Take a selfie video. Do some BombBomb video. Use Soapbox. 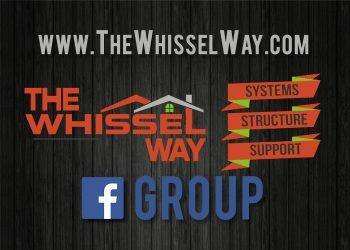 Come onboard, come on over to Whissel realty. We’ll get you plugged in, get you a monthly green screen video. You know, that’s all free advertising. Coca-cola, Pepsi, Toyota, they spend hundreds of millions of dollars a year advertising, and here, like Kyle has done, he has just used video, two minute video segment, chopped it up, put a 15 second blurp up here, a 30 second blurp up there, and he’s got, I don’t know how many followers? – [Jason] There’s tons, but he’s all done it by trial and error, and so he’s already done it, and that’s what’s great about a leader like Kyle, is he’s doing what he’s preaching. Right, a lot of people say “Do this” and they don’t do it, themselves. A lot of brokers out there just sit back and wait for the agents to sell. He’s always one of the top salespeople. He’s doing the video, and he’s done so many trial-and-error’s working with Brian and Tom, they know exactly what to do to help all the agents here at the Whissel Way, and I appreciate you mentioning that, Keith, so. I know I’ve only got a few minutes left, but you know, talk about getting pre-approved. A lot of people go online, and they run these mortgage calculators, Because the online calculators want eyeballs on their site. – So they’re going to tell you a $500,000 house, the payment’s 1,500 bucks. And that sound great, but Dave and I know, unless you’re putting like 400-grand down, you’re not getting a $1,500 payment cause the taxes on a $500,000 house is at least 500 bucks a month, right, Dave? – And it’s amazing, people are like, “But I saw it online. I believed it.” And that’s where, and they can even get these pre-qual or pre-approval letters, and so you got to be really careful when you’re out buying and you want to make sure you do your homework, so you were kind of talking about it, I imagine, in your skit. – Yes, and I was just thinking, these online mortgage calculators, as the saying goes, “The bold print giveth, and the fine print taketh away.” I wasn’t aware, no, seriously! – And you’re putting like 25% down. – Right, that you qualify for this. And so you’re going out, looking at homes that set maybe maybe several-hundred-thousand dollars above what you can really afford, based on your credit score and down-payment. So, here’s my experience with, just as of lately, I’ve been working with Jason here to get pre-approved, and something I didn’t take into consideration in the past, is, hey, it can be more than just a one-day process, and in my experience, it’s several days, as we get some paperwork and submit it and forms together for that, and I got thinking. What if there was a house that I absolutely fell in love with, and I wanted it, and there was three other buyers out there writing offers for it, but I was being delayed because I couldn’t get all my stuff in to get my pre-approval in time, in order to submit my offer? I would definitely miss out. So now, having this experience, I highly recommend everyone to get with Jason, to get with David, to get with a mortgage broker, sit down, go over all the paperwork, look at your credit scores, get your pre-approval, and then, like Jason, he’s an expert in credit-repair. He can make some great recommendations. Dave can, as well, in ways that you can make your credit score just jump up five, 10, 20, 30 points, which can make the difference of a little bit in interest rate, an eighth of a point or whatnot. – [Jason] It all adds up. – It all adds up. – [Jason] You want to have the best score when you’re looking to buy. – And all that takes time. So I can’t stress enough. If you’re out there, you’re thinking about writing an offer, going out, looking for a home, get your pre-qualification beforehand. – As the saying goes, it’s kind of like putting the cart before the horse. It’s better to go out there armed and ready like a soldier going into battle, knowing what your armor is and what you can offer. – Yeah, so that’s the Whissel Way. We’ve got the video man, Tom, and Brian. – They take care of everything, and if you’re looking to ever make a change, think about getting real estate, check out Kyle Whissel on The Whissel Way, right here on the podcast. There’s information on how to contact him directly, And him and one of his sales managers might be able to talk to you over the phone or sit down and meet, so, highly, highly recommend checking them out. The best team in San Diego per The Wall Street Journal, now four-plus years in a row. Looks like that should be here for the fifth year, as well, so thank you guys for listening to the podcast. – Thank you for having us. – And we’ll see you guys next weekend.